This is a Stargazy Pie, just chock full a nuggety lip-smackin' nutrition. It's got fiber and protein, minerals, vitamins and loads a brain buildin' Omega-3's. You ask why there's fish heads stickin' up outa that pie crust? Well DUHH. We don't want any fish heads in our pie. 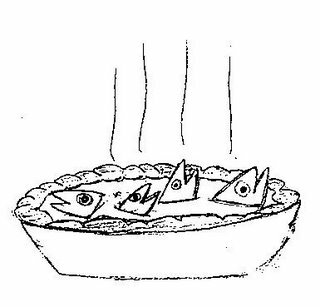 Now, you might be thinkin that this is some sorta allegory for the president or his Surge n' Purge™ strategory.But you'd be wrong because, eeeuuh....yuck, we don't allow no half-baked fish pies around here.